A Quote-You move and you're dead, do you understand me? Colonial Laser Pistol: 5D Damage, Range: 3-10/30/120, sealed flight suit, comlink, Medpac, Colonial uniform, toolkit, Raptor Shuttle. Boomer is the squadron's rookie. She's a talented pilot with a reckless streak and a secret. A Raptor pilot on the Battlestar Galactica, she is just out of flight school and it shows -- she's less sure of herself than the other pilots, more vulnerable. Her co-pilot on the Raptor is Helo, two years her senior. Sharon has a secret relationship with Chief Petty Officer Tyrol onboard the Battlestar Galactica. 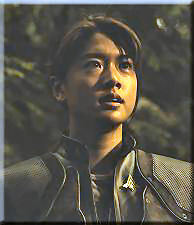 During the Cylon attack, she and Helo help a few civilians escape the Colonies. One of the people they rescued is a young boy name Boxey, who Sharon adopts.